Heather Lewis came out on top in her Welsh walk duel to claim gold in Birmingham. Heather Lewis won the battle of the Welsh race walkers as she took over the mantle of British Indoor Champion from Bethan Davies in Birmingham on Sunday. Pembrokeshire’s Lewis led the way for Wales as four athletes returned home with medal winning performances on the second day of the championships. 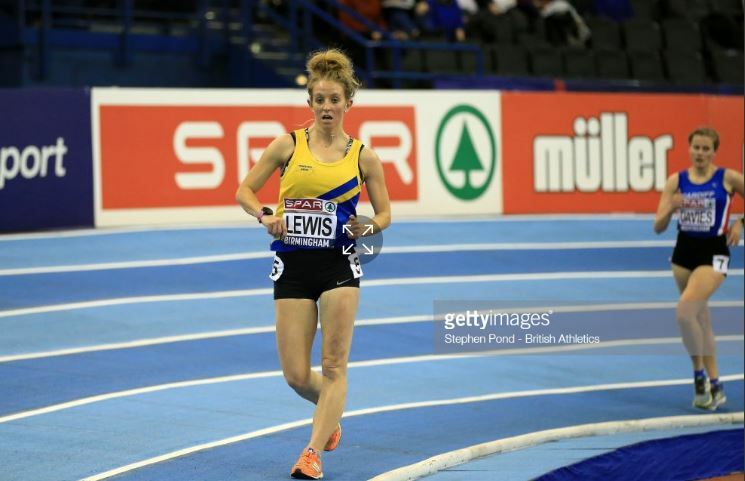 Reigning British champion Davies took the lead from the start in the 5000m race walk with Lewis shadowing her up until the half-way stage of the race. The two Welsh Commonwealth Games athletes enjoyed a commanding lead over the remainder of the field as Lewis took over at the front going into the second half of the race. The former British Champion opened up a lead of some 10 metres to put pressure on her Welsh team-mate, who was then disqualified from the race. With her main rival gone, Lewis’s chief challenge was to concentrate on her technique and ensure she didn’t join the growing list of disqualified athletes. The 2014 outdoor British champion negotiated the remaining laps comfortably to finish almost two-and-a-half minutes ahead of her nearest rival in a new PB of 22:55.15. Lewis, who herself had suffered a disqualification at last year’s championships said afterwards: “I am really pleased that I won and I am happy to get through the race technically and enjoy the race. Birmingham is a really tough place for race walking. Owen Smith. Pic: Owen Morgan. “My next competition is in Switzerland in Lugano. Our usual race walking distance is 20km and that is the start of the season which will hopefully allow me to qualify for the World Championships and the European Race Walking Championships. In contrast, Davies said: “I’m obviously very disappointed. I have not had the best winter season leading up to this but everything in training had started to go really well so I was looking forward to racing. “Everything was not quite there and I didn’t feel comfortable but it was a fantastic race by Heather and it’s lovely to see another Welsh girl take the win so I am really happy for her. It’s a long season so I have plenty of time to build and get on top. Following Lewis’s gold, Owen Smith claimed silver in the 400m, clocking another big PB in the process, having set his previous best time in qualification on Saturday. The Cardiff AAC man also claimed automatic qualification for next month’s European Indoor Championships in Glasgow as he clocked 46.37 in just failing to chase down gold medallist Cameron Chambers. The North Wales product said: “I’m very happy with the time. I didn’t expect Cam to come out as quickly as he did, so he pulled me along perfectly. “I was trying to stick on him as long as possible but I didn’t have enough to get on to his shoulder and to get past him. “I couldn’t have asked for a better result; auto-qualification for Europeans makes the next three weeks more straightforward as we’re not waiting on selection. Welsh sprint ace Melissa Roberts. Pic: Owen Morgan. Swansea Harrier Joe Brier just missed out on a medal finishing fourth, but did enjoy the consolation of second personal best of the weekend clocking 47.42. Meanwhile, in the field Adelle Nicholl claimed a bronze medal in the shot put with a throw of 15:58m. While the Cardiff-based athlete wasn’t entirely satisfied with the distance, she was delighted to have claimed a medal and is now setting her sights on the British Universities championships. Nicholl said: “I’d never thought I’d be happy with 15.58m because my PB is higher but I’ve recently changed my technique to rotational and that’s a PB with that technique. Cardiff AAC multi-eventer Saraha Omoregie finished fourth with a season’s best distance of 14.77. The final Welsh medal of the day was gained by sprinter Melissa Roberts who earned bronze in the 200m. Two weeks after winning the Welsh title in Cardiff, the Birchfield Harrier clocked a personal best of 24.28 in the final which was won by Hayley Mills in 23.59. Wrexham’s Amy Odunaiya, who clocked a personal best of 24.20 in her semi-final, finished fourth in a time of 24:47. Full results from the two-day championships are available on the British Athletics website.